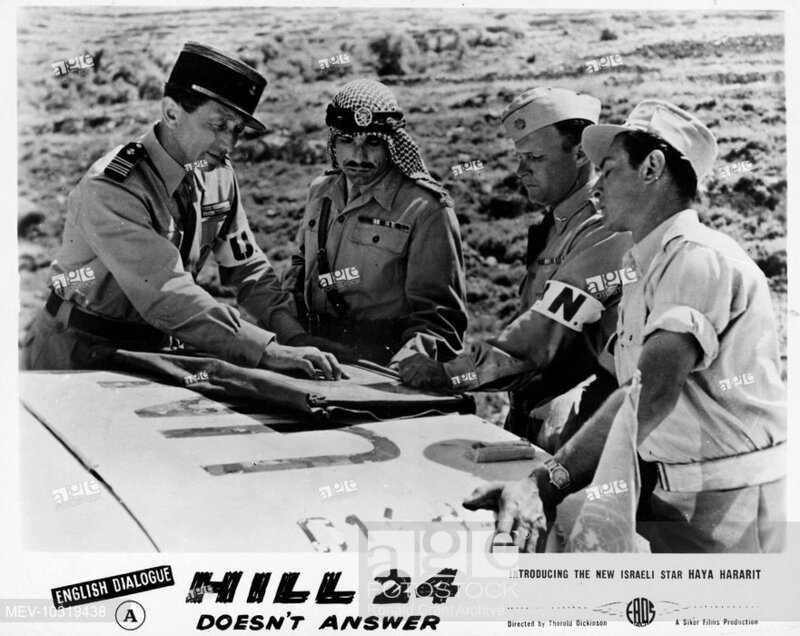 Saratoga Jewish Community Arts, with the generous support of the Jewish Federation of Northeastern New York and the Golub Corporation, brings the 1955 film Hill 24 Doesn’t Answer to Saratoga as part of its annual series on April 28, 2019, at Temple Sinai. founding and War of Independence through the narratives of three recruits to the Israeli Defense Forces and a volunteer. The four individuals are preparing to head out to a hilltop outside Jerusalem in 1948, on the night before a United Nations cease-fire is to go into effect. It is deemed essential for the Hill position to be in Israeli hands when the UN inspectors examine the front line the following day and draw the line that will mark the new, if unofficial border. Jewish tourist, a third- generation sabra (born in the country for which they are now fighting), a non-Jew who had served with the Mandatory force in Palestine and is won over to the Zionist cause, and a young nurse of Yemenite descent. As the movie begins, the dead bodies of the four are discovered on what turns out to be Hill 24. They have held the point for Israel, and sacrificed their lives in the process. While produced in Israel, it was filmed in English with only a handful of lines in Hebrew with an eye to the global market. Although it is the Israeli point of view that is predominant, it is not excessively addressed in this first feature-length production to be shot and processed entirely in Israel. What the producers’ project are some reasons why this passionate fight was fought by heterogeneous groups. Hill 24 Doesn’t Answer was entered into competition at the Cannes Film Festival and while it didn’t win the top prize, it was favorably received. Hill 24 Doesn’t Answer will be shown at Temple Sinai, 509 Broadway in Saratoga on Sunday, April 28 at 7 p.m. A dessert reception and panel discussion will follow. A $5 donation is requested. For more info and or RSVP, please call 518-584- 8730 option 2., or email office@saratogasinai.org.